Say goodbye to kick-you-off-your-bike pedal strike. I’ve had plastic pedals on my polo bike for years now and I won’t switch to anything else. 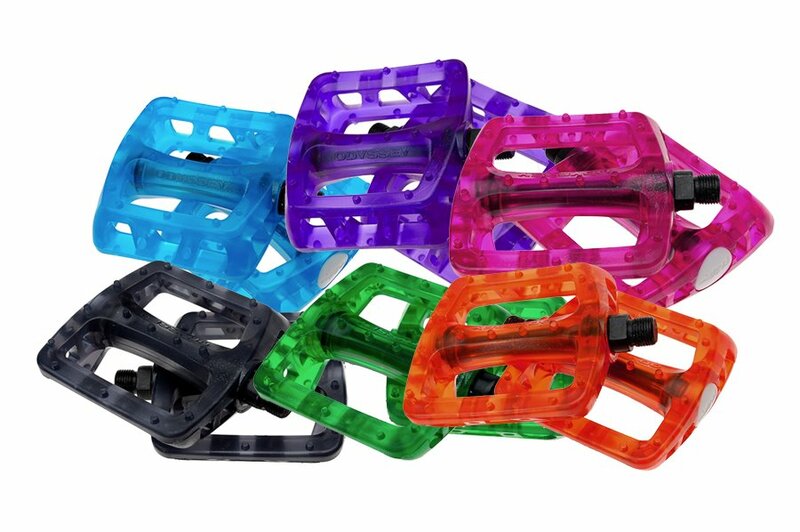 I used to run the crappy narrow plastic pedals that come in the box with complete road bikes and such. The ones that usually get thrown away. I liked them only because when I would pedal strike on the court, the plastic would grind away like wax to a curb, instead of lift the rear wheel like a metal pedal will do. But when I started to ride real BMX pedals made of plastic, two things happened. One, my bike looked a lot better. And two, my feet didn’t hurt from flexing over those tiny, cheap things I was using. Get’em from Ben’s Cycle, they have them in stock now. This entry was posted by Doug D on September 17, 2008 at 7:29 pm, and is filled under BMX, Products. Follow any responses to this post through RSS 2.0. Both comments and pings are currently closed.